When I chose Wayanad, Kerala as my project site, it was a dream come true for a guy coming from a dusty place like Delhi straight into the lap of the famous Western Ghats of India. The first few days here were like that for any other tourist exploring a place of natural beauty, meeting people of an entirely different ethnic background, having traditional food, etc. Wayanad, where most of the spices are grown, has a lush green environment and there I was trying to do what I have always wanted to do. Slowly, this rosy picture began to fade away as I was faced with the challenges of getting adjusted to local food, living in a jungle like place, surrounded by people who speak an entirely different language. I started concentrating on my project, which was to focus on developing a value chain for small ginger farmers. Ginger is one of the most important spices used in all kinds of Ayurvedic medicines, food, beverages, perfumes and many other industries. Kerala is one of the largest producers of ginger and yet farmers from Kerala were migrating from here? These were the questions that sent me to Coorg, to meet these farmers. When we reached the field, everybody was busy working in the field. Both men and women were engaged in removing weeds manually from the field, while others were irrigating the field and instructing labourer’s to do various jobs. One thing was common to all these fields; there was a hut either in the center or in a corner of each field. Observing a few strangers coming to his field, a person came out from one of the huts wearing a dhoti and shirt. My guide spoke to him in Malayalam and a sudden smile lit up his face. 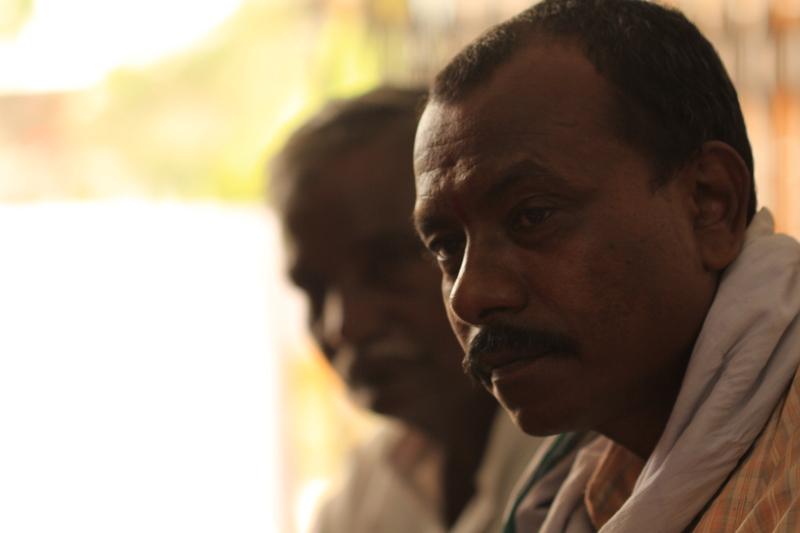 He was one of the farmers who had migrated from Meenangadi (Wayanad, Kerala) for doing ginger farming at Coorg. I took out all my assets – diary, pen, recording device in order to quickly record the conversation, which was the reason I was there. On seeing this equipment the smile faded from the farmer’s face and I slowly slipped everything back into my bag. Being unable to understand Malayalam, I was just observing my guide speaking to the farmer, and allowing him to establish a good rapport so that I could speak to him later on about my project. The farmer invited us to his small hut which had space for a T.V, Kitchen area, bed, chairs, table, storage for farm equipments etc. Everything was accommodated in a very nice and neat fashion as if they had hired an interior decorator to arrange these things inside that small hut. Now I slowly ventured to enter into their conversation, with my guide translating for me. I told them about the purpose of my project and they were happy to know that we were doing something for ginger farming. Actually they were very happy to see people from their homeland, Kerala. They told us that they had migrated to this place because they were facing problems like very low yield from cultivation and many ginger based diseases in Kerala. So they had taken land on lease in Coorg and stayed there for the entire crop cycle, till they sold their ginger and then went back home with the money that they had earned. It reminded me of soldiers, living in very adverse conditions, fighting battles and then going back to their home after the battle. They served us black tea and Paan, and the conversation went on about various issues related to ginger farming and their tough life in Coorg. I didn’t record anything, as it made them feel uncomfortable. We visited a few more similar farmers. 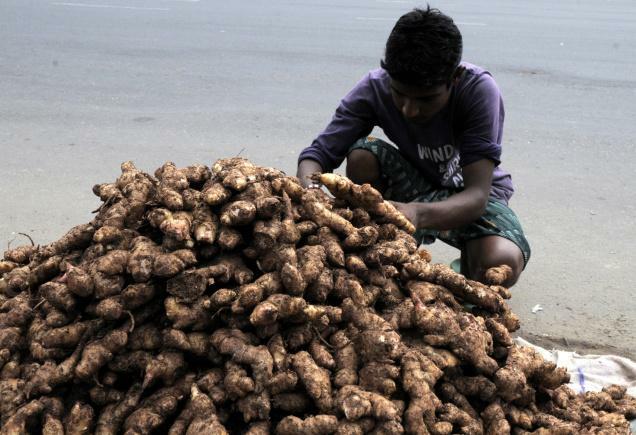 After four months of my visit to Coorg, I found that the ginger prices have crashed to one third of what it was for the past many years. Many of the farmers suffered huge losses and unable to repay their loans a few committed suicide as well. The newspapers also reported that some of the farmers who had migrated to Coorg from Kerala had also committed suicide. It is very difficult for me to even imagine if they were the same farmers whom I had met; I still remember their smile and wish I could have helped them in some way. Ms. Geeta Verghese, Coordinator SBI YFI with Shri. 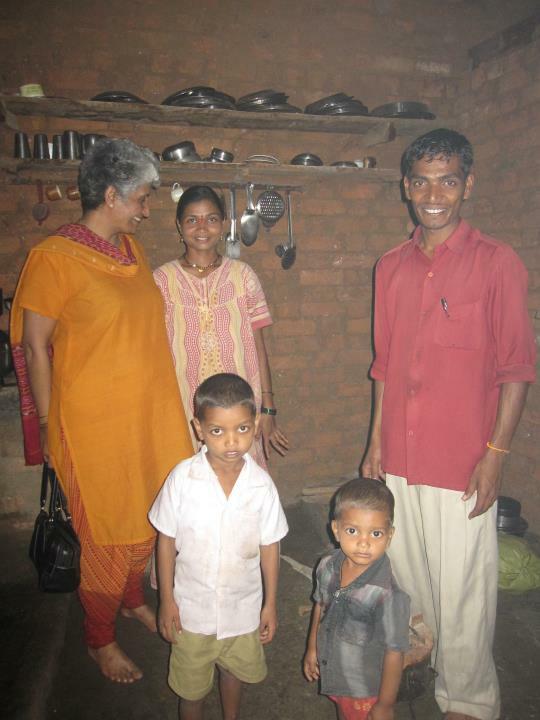 Mavanji Pawar and his family at their home in Jawhar, Maharashtra. During the course of my fellowship, I studied dozens of schools superficially and worked closely with 4 of them. All four were tribal ashram schools (residential schools funded by Tribal Development Department) in the Nandubhar district of Maharashtra. This is primarily a tribal dominated district in the state. I work with children to create motion picture documentaries which will capture the best practices in these tribal ashram schools. Working with the kids in the schools is the easier part, while working with the teachers was slightly difficult. I would never get them. 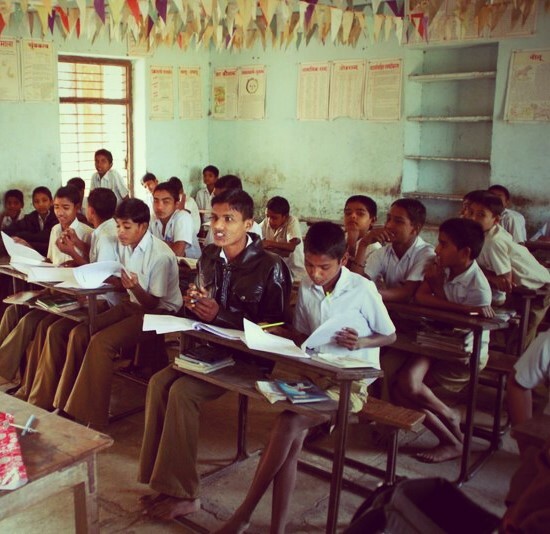 The school that stuck out like a sore thumb amongst the 4 was Kolda ashram school. The teachers here would routinely disturb me, not allowing me to extend the class even if the kids were charged up, give me the last hours of the day to conduct classes, scheduling routine medical check-ups during my hours… The result, I had managed to conduct only 3 classes during 3 months. During the whole struggle, I was asked to take Friday classes. I was thrilled at the gesture and really respected their concern towards my work. On Friday I landed up at the school and started my class. I was happy at the success and was trying to get the pupils’ attention with a small game. After a few minutes, an old lady barged into my class and instructed all the children to assemble at the ground. This ambush and her military bearing with the children ensured that the children were gone in no time. I was confused and furious. A week after that, I was literally thrown out of the school, for on grounds of interrupting school activities. I then started working with 2 other schools. The situation was the same there, but I was able to conduct classes without any hindrances. I completely ignored the Kolda School. Finally, the program coordinator of my project Mr Pagare, the field coordinator Ms Ali and I arrived at a decision to hold a meeting with the staff of Kolda School. Mr Pagare with his experience conducted the meeting intelligently asking me to explain the objectives and to show them the results of the other schools which I had already done several times before. The teachers had nothing but complaints not only about me but also about Ms Ali, who like me works there. Mr.Pagare just accepted all these complaints and even expressed apologies on our behalf. I pushed them to agree to nine full day’s commitment whereby I could compress all the 3 months work into it. The headmaster agreed to allow me to work for two full days in the school on a holiday which was to be clubbed with a Sunday and said that he would eventually let us know about the rest of the days. We agreed immediately and left. Post the meeting, Mr Pagare asked me to invite the principal trustee of the school to inaugurate our two-day workshop. I understood the rationale behind the scheme. He wanted to smoothen out the problems with that idea. The principal trustee of the Kolda School, Mr.Raghuvanshi was an ex-MLA. He readily agreed to my proposal and promised to extend help in all possible ways. I took this promise lightly considering his political history. Of course it was his school, but the attitude was different from the teacher. We informed him a day prior to the workshop and also tried to inform the head master of the school but he never received nor returned our calls. I finally sent a message via SMS about the latest development. Mr Raghuvanshi arrived at the school well in time, in fact on time. We were late by ten minutes. The Headmaster’s face showed anger and he took us aside to question us on what the occasion was. The visit of the big man had the Headmaster running for cover. Well it looked like it was to be a big event: two SUVs, body- guards, a secretary and a press reporter to my surprise. I was totally impressed with Mr Raghuvanshi’s punctuality and sincerity. I concentrated on the job, did not entertain the Headmaster’s private enquiry and took him to the dais where all these people were seated. I spoke about my work and requirements. Mr. Raghuvanshi asked the staff to extend their cooperation towards the project and the headmaster readily agreed. We were all relaxed except for the Headmaster. He spoke to the children and asked them to be attentive in my class. The principal trustee spoke to me and wished me good luck and left. I asked the children to gather in the classroom. The Headmaster laughed nervously at me and said “Sandeep bhai, it is very rare to find people with commitment and Mr.Raghuvanshi is one of them”. I expected the nervousness, but felt uncomfortable at being addressed as ‘bhai’. He continued to say “you should have informed me earlier so that I could have made better arrangements. I was just able to get a press reporter”. That really confused me; I enquired if that was not the big man’s idea to which he replied “I just wanted to help my reporter friend to find some news, poor chap sometimes lacks news”. Good Heavens! I told myself that I would never be a teacher. That incident changed my impression about that 87 year old man who works at his farm and runs around 10 schools. While my impressions are sometimes deceptive, my understanding of teachers at government schools still stands true. I worked till late that day and the teacher took care of my food, chai, accommodation, sent out hot water for bathing and even jilabees to my surprise – and that too, on a Sunday. It was the Grama Sabha of a village located in the North-western part of Karnataka. I was present at the Gram Sabha along with the staff of BAIF, to present the list of beneficiaries in the BAIF-MGNREG scheme for the year 2011-12. The Gram Sabha is the local governing body where discussions are held on all aspects of the developmental schemes in the village with the elected representatives and panchayat officials in the presence of the villagers. The decisions arrived at the Grama Sabha are binding on the local government bodies. However, Grama Sabhas in these parts are notorious for either poor attendance levels or fractious faction fights! Moving on with the story of this Grama Sabha, the venue was the local temple premises and the scheduled time for the meeting to commence was 11-00 AM. There was a sprinkling of people already assembled at the venue. A noisy drunkard attracted the attention of almost everyone; I was surprised that someone could get drunk so early in the day. I could not help but to nurse sympathy for a kindred soul. But then, the issue of alcoholism is a very sensitive and troubling issue especially in rural areas and almost everyone tends to paint the whole issue with a broad brush with utmost contempt for such people. The Grama Sabha was delayed for more than an hour on account of one Panchayat official. While all were seated and waiting patiently, our man the drunk promptly picked up a fight with one of the locals. By this time, most of the people in the Sabha had decided to ignore the drunk in their own self interest, given the man’s propensity to throw the choicest abuses at people. The Sabha got underway with the elected members and the panchayat official leading the discussions on Indira Awas Yojana scheme and their potential beneficiaries. The drunk promptly interrupted the proceedings with an emotional outburst about democratic systems and the importance of the Grama Sabha, all this interspersed with abuses. He was shouted down by the rest of the crowd. He left the meeting in a huff to the collective relief of all. The discussion moved on to the topic of NREGA beneficiaries (work in private lands), and then the drunk made a dramatic entrance. 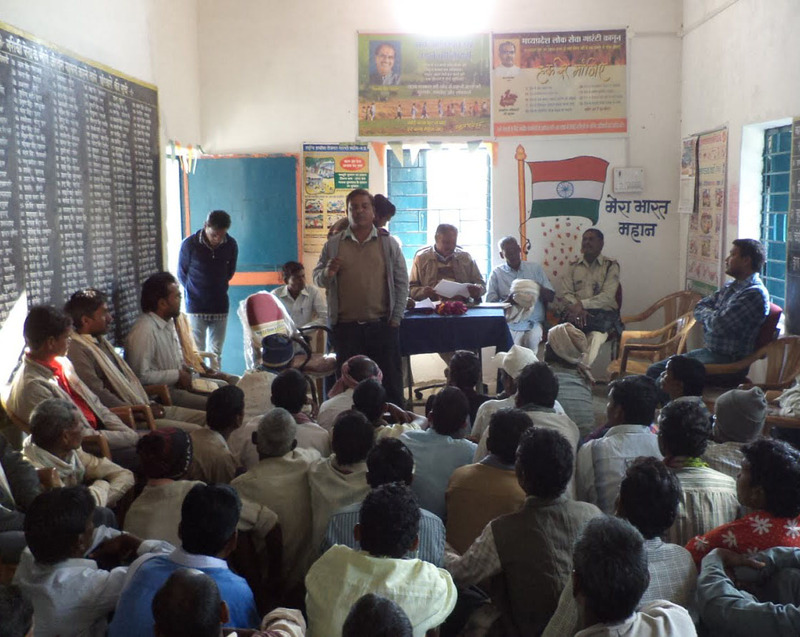 Rumor had it that he had only gone out to fortify himself with more spirit and this time around he was not to be shouted down, he forcefully made his point about the primacy of citizen’s right to be heard in the Grama Sabha and some wild allegations of corruption in last year’s NREGA works. He simply had to be heard in order for the Sabha to move on, so with a weary approval from the crowd he was heard. He alleged leakages in the distribution of coconut saplings for beneficiaries who had set up a horticultural plantation. The main thrust of his argument was that the beneficiaries did not receive any amount for the labour for planting the saplings. This issue was immediately picked up by a couple of farmers who were the beneficiaries, and they demanded to see the relevant files for the exact number of saplings which were accounted for. This sudden turn of events had the panchayat official (in particular) squirming; gone was the earlier confidence and authority. But it seemed that the files had managed a vanishing act from the office and were actually in the possession of a NREGA mate. This issue was again hotly debated as to why the files were not in the office. The official made a hasty exit to get the files, and returned with a sheepish grin on his face which said it all to the now animated crowd. The mistake was admitted and promises were made to ensure that the deficit was made good. Later on, I found out that – not only the veracity of the claims of the drunkard was confirmed, but also money reached the beneficiaries. Personally, it was an experience that showed the danger of jumping to hasty conclusions with pre-conceived notions. But more importantly, it was really heartening to see the effective functioning of a legally mandated people’s body and the corrective mechanism of the Gram Sabha in overseeing the functioning of the local self-government. It seems just yesterday when I decided to leave my job and enter a program that would supposedly help me to help my rural brethren. My reasons for doing so were many, so many that it is hard to pinpoint one of them as ‘the reason’ but the bottom line was that somehow I managed to convince myself to take the step. There were questions of course, from others, from family and last but not least from my own self. Questions that were rooted in fears and inner contradictions riddled with self-doubt and colored in uncertainty. The most common one, Will this benefit your ‘career’? (In essence, how will it help me make more money in the future? )- A concern, I found reflected across the tiny set of humanity that had leisure enough to give my life choices a thought and me advice. I quenched their fires of criticality (or at least I hoped to) through stories of how this will help me in my higher studies, how the best universities value this stuff and how this will be a great learning. As for me, I was not sure of any one of them. Not that these things are not so – it was me who wasn’t sure if those were really my reasons. There were other queries, like why are you doing this? This question it seemed was a tenacious little prick and had the knack of cropping up at the most uncomfortable of places (especially when meeting important personalities and delegations) and to add to the confusion I found myself giving a new answer each time, each one more and more unbelievable. I have my doubts about my motivations, my conscience constantly pits my actions against beliefs, judging, unforgiving and ever so critical. Was it twists in personal life, or a genuine want to serve others? Was it a pure scholarly pursuit of learning, or a self-serving charade for getting into institutes of higher learning? Was service to others supreme or were the actions rooted in a want of appreciation? Predictions were made, and many experienced elders commented that it was a mere phase, a break I needed from the routine and I would be back to their worldly ways soon. A year into the fellowship, I have a few words to say though. All the academics in the world may write as much as they want, in as many fancy words as they can about this country and its people, their plight and their struggles but it will always be wanting. For it cannot and never will hold comparison to what is out there to be seen, to be felt, and to be heard on our own. A year into the fellowship, gone were all the definitions and differentiations, washed away in a deluge of experience. No more was I able to see others as rural or urban, rich or poor, literate or illiterates, upper castes or dalits. Everywhere, all I could see as far as I could see were people. Same, in their needs and wants, their hopes and aspirations, their obstinacy and inertia, their efforts and struggles. Gone were all delusions of ‘uplifting them’, wanting to make them more like us and it was replaced by shame, shame about my own superfluous sense of superiority that had led me to believe that my way of life was something better and worth being forced upon them. The grass always seems greener on the other side. And what works elsewhere may never work here. We are unique, as like everyone else, no better, and no worse. Inclusion is achieved not through criticism or rejection but only through deeper understanding. So I have quelled that bit in me that thought I am going to save the world and help the poor, for I believe I am poorer than them. The only way I can help is to serve but only after I have understood them myself. Only when I have walked the same paths as them, eaten the same bread as them, slept the same space, breathed the same air, shaken out of my trance of knowledge only then can I even start dreaming about service. Village: Surishettikoppa village in Dharwar district of Karnataka. Settling down in the sweltering heat of Dharwar was fairly easy, but mingling with the villagers on campus was not! For them I was an outsider working on some project and one who would leave when his work was done. While my departure was inevitable, yet I was not there to do some “study” that generated yet another report but to lend my hand in improving the practical aspects of their lives. I was determined to create a mark for myself and leave behind a positive impact. As I spent my early days going around the campus and observing how things worked around here, I wondered how I could get entry into the villagers’ circle of trust. And then it happened! 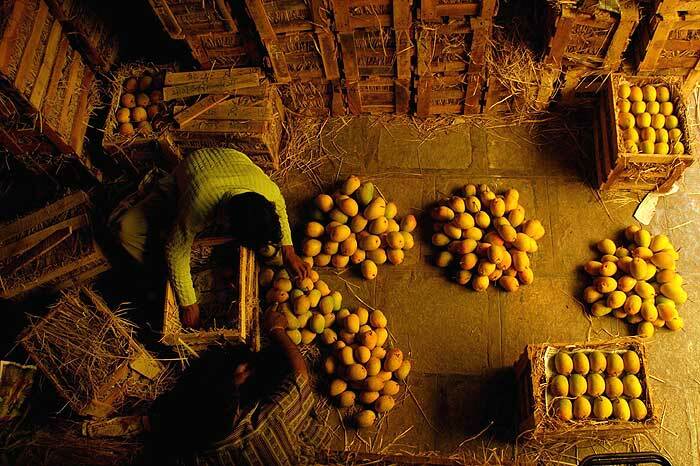 One fine day, I noticed a group of people working on segregating, packing and loading Alphonso mangoes onto a truck. This scene in itself is very beautiful. The lush green and yellow shades of the mangoes can be very mesmerizing. Not one to remain behind, I went and picked up one luscious looking mango from the segregated crate. As I started eating while leaning against the back of the truck, I noticed that only one worker was loading the crates onto the truck while the rest of the group was busy segregating the fruits. At one point, the worker lost his balance and I instinctively reached out to help him – this was when I realized how heavy each crate was! I thought to myself that I should help him load some crates to pay back for the delicious fruit I had eaten. As I stepped up to lift some crates, their curiosity about me got the better of them and they all started asking me questions which I duly answered in my halting Kannada. My lack of fluency in the language made it a	humorous affair. Time flew as I was listening to their small talk, the jokes they cracked amongst themselves and I realized later that it took us 5hrs to finish the work that day. This small interaction gave rise to many more such meetings of friendly banter, frequent exchange of eatables and built a foundation of understanding between us. Now, each time I think of this incident, I feel amused at how my initial greed to have a free mango had initiated a process of icebreaking. This is not just a story-it’s a true story. This is what I witnessed at the Agriculture Produce Marketing Committee market (APMC), Shahapur, Thane. That’s where I understood the (real) gravity of the situation, rather than something perceived and projected by the media, which determined my choice of a project – to work in the area of vegetable business. 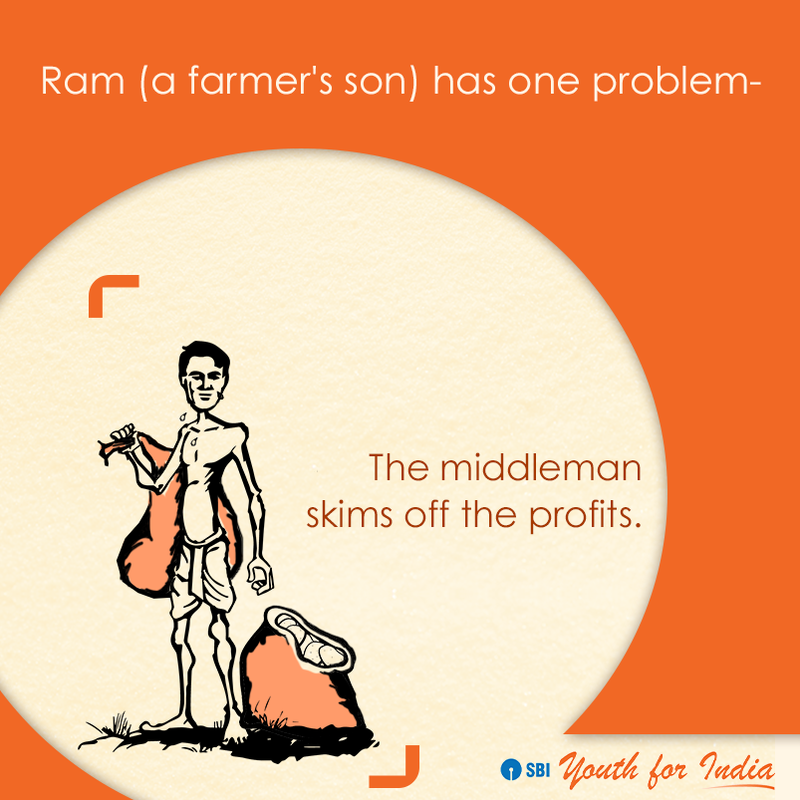 This farmer has a 19 year old son, who is studying F.Y.B.A., let’s call him Ram. He is on summer vacation now, so his father has asked him to go out and sell the Bottle Gourd, in the APMC market. Quite excited, he gets one ‘Bori’ and fills it with around, 55 Bottle Gourd. (This weighs 30-35Kg). Then he puts the Bori in a tempo and travels for about 45 minutes. Pays 20 Rs as Bori transportation charge and 10 Rs as his fare. That’s how the second trade ended. Now the young chap is getting frustrated and beginning to lose his temper. Particularly, as the trading is taking place in peak summer in the middle of April, at around 1 o’clock. Negotiations continue for another hour, while he hopes to get a good price he is also starting to lose his patience. Finally the trade took place and he sold it for: 1 Rs/piece. Rs 47 he had to spend and he got Rs 55. That is – he got Rs 8 in hand for lugging around 30-35 Kilos of Bottlegourd – We have not even talked about the cost of pesticide, seed, fertiliser and labour cost, etc. You can imagine the expression and emotions of the guy when he walked out of that market. What purchasing power will he have? Won’t he die of hunger or under the burden of loans? And now after completing his graduation, will he prefer to be a watchman, a security guard, a doorman, or THE FARMER? I guess we all know the answer.